Two Big Thumbs up for Local Three! Hi friends! It’s been far too long since I’ve written a proper “She Ordered What?! ?” post, and I’m soooo glad to be back to my mischief! On Tuesday, after flying into Atlanta in preparation for several meetings in that local office, my coworkers and I went out for a team dinner. Our (relatively new) teammate, Christina, took the lead in making plans for the team. She knows that a few people on the team (not me!) are “foodies”, so she was quite nervous about making our reservations! Her choice was to take us to Local Three Kitchen and Bar, a place she’d been wanting to try, but hadn’t yet had the opportunity to visit. We entered a beautiful office park (which we all not-so-secretly admitted that we’d LOVE to be the home of our new office – sadly, ain’t gonna happen), and walked along the sidewalk until we met up with a lovely young woman and her seven month highly energized pup. As we played with him a bit, she asked if we were looking for Local Three – in her words, “You have that look!”, and she proceeded to instruct us in. My former boss, Bob, is the resident wine expert. As he usually does, he chose two fantastic wines for the table. 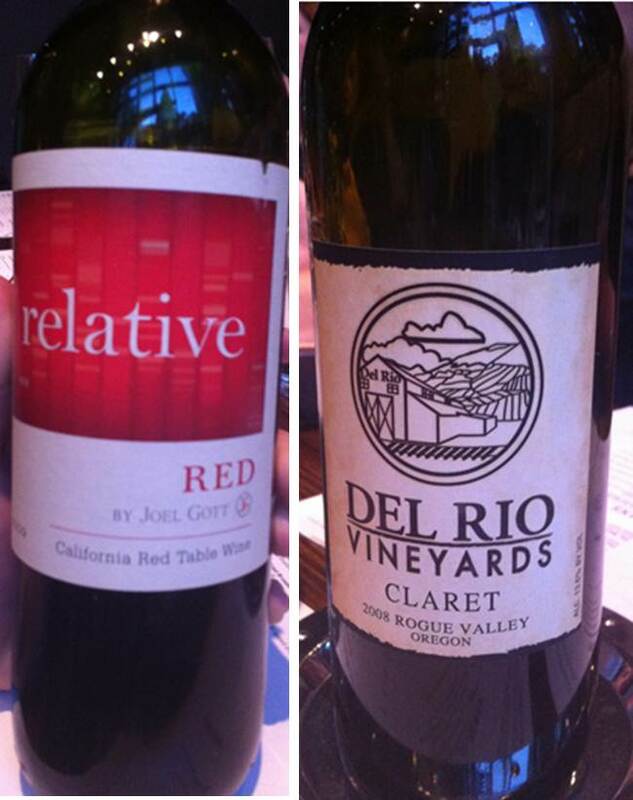 His picks: “Relative”, a Zinfandel-based blend and “Del Rio Claret”, a Merlot-based blend. When asked which wine I would like, I advised our server, Patrick, that I would like him to choose my meal for me, and therefore, choose the wine which would best pair with the meal. He quickly glanced at my blog card, tucked it in his pocket, said “Okay, cool! Let’s start you with the Relative, and switch you over to another wine during the main course.” And, he said it all with a big smile on his face! Ah, how I’ve missed trusting the experts with my meals! Meet Patrick! He provided stellar service that evening. So we sipped on wine while we waited for the appetizers to be delivered. 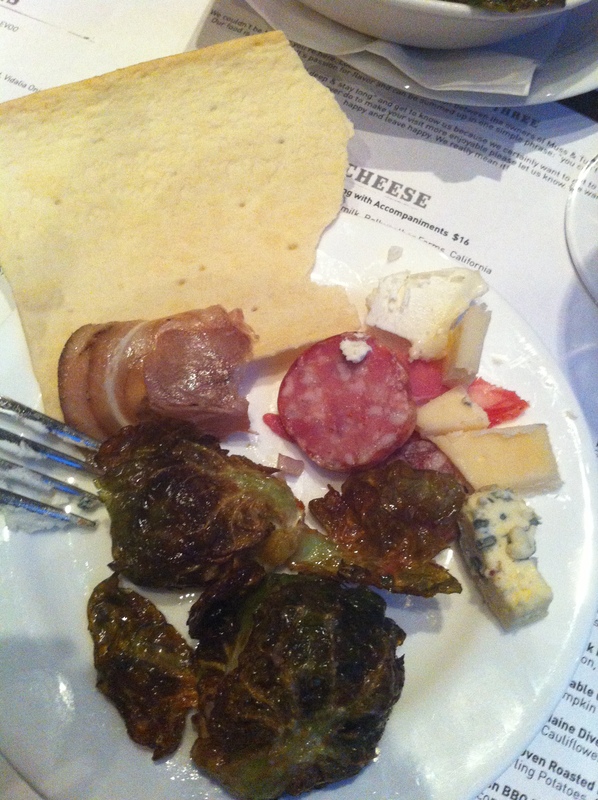 We also shared the cheese tasting and accompaniments plate (with the most delicious Le Bleu cheese!) 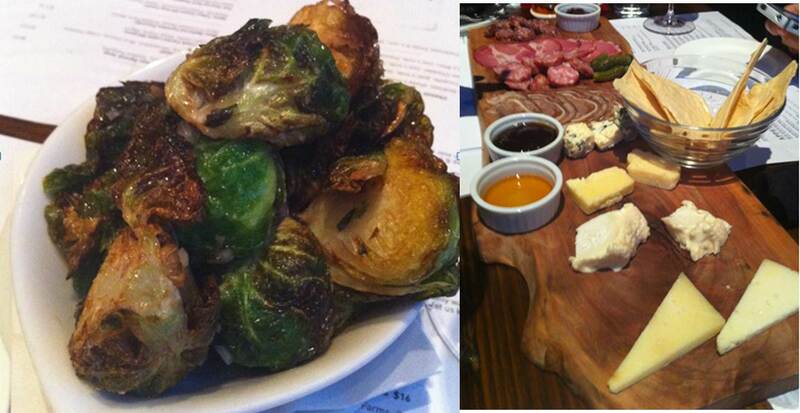 and “The Notorious P.I.G.” – a Charcuterie sampler with accompaniments. Both had amazing flavors! And, seriously, y’all, Local Three found a way to use bacon grease (officially known as spreadable pork fat), serve it up as a condiment, charge for it, and make you ask for more! 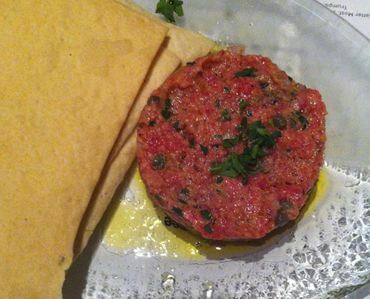 Additionally, my coworker, Ann, ordered the “El’s Beef Tartare”, and offered me a bite. It had wonderful flavors, and a subtle bite to it. It was delicious! Turns out, her husband is an accomplished chef, and she knows her food! She wasn’t even one of the folks Christina was originally worried about, but Ann is indeed a foodie! Then came dinner. It’s fun when restaurants use team serving. Someone lays a plate down in front of me, assuming I know that it’s mine, and I have no clue! When a dish of pasta was laid down in front of me, I looked around to see what I had been served. In swooped Patrick to explain that the chef had prepared the Spicy Tybee Island Shrimp Fusilli (with Escarole, Preserved Lemon, and Sweet Peppers). 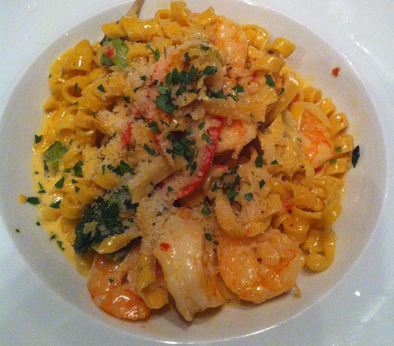 Before I even had a bite of the shrimp, I was in love with the flavors of this pasta. The citrus undertones with a slightly spicy bite to it…magnificent! 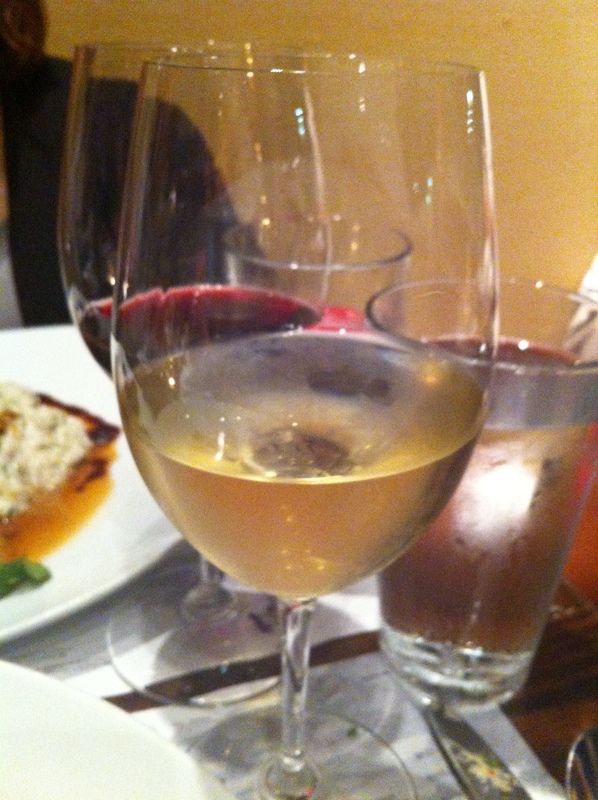 And, Patrick brought me a glass of Olivier Lefaive Les Setilles Chardonnay to pair with it. Prior to serving the dish, he had mentioned that either red or white wine could compliment the meal he was planning to bring me. He was right. I could have easily stuck with the “Relative”, but the Chardonnay complimented the dish really nicely. 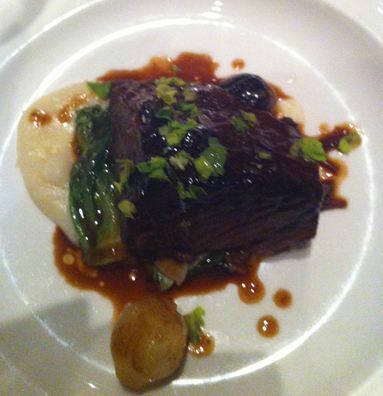 I couldn’t finish the main course either, but that’s no reflection at all on the food. It’s simply that we ordered enough food for ~20 people, although we only had eight people at dinner! Did that stop some from ordering dessert? Nope! I did pass on dessert, but my coworkers sampled a few things. 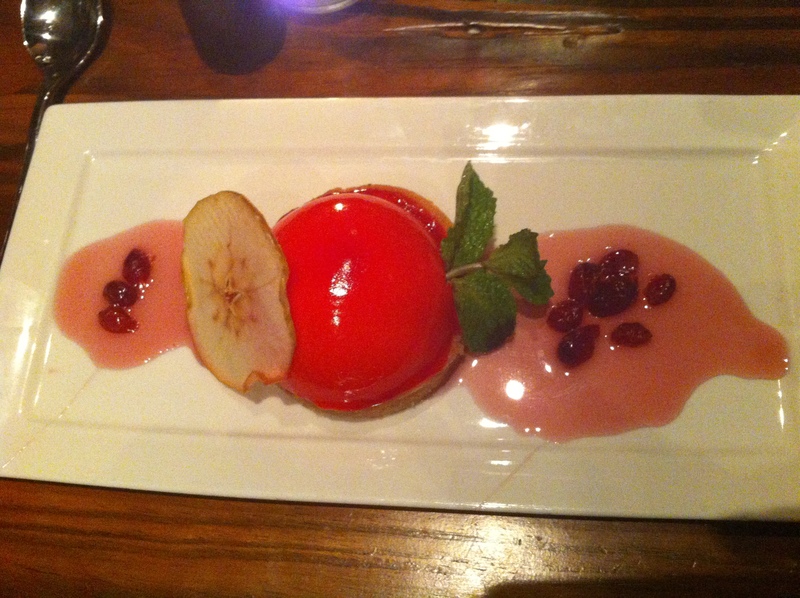 This is the caramel apple dessert, about which Patrick said “the presentation is amazing!”. Yes, it looks great, but honestly, nobody was particularly thrilled with the taste or texture. Buried deep inside were baked cinnamon apples, which were tasty, but the rest lacked flavor. Christina ordered the banana bread pudding. 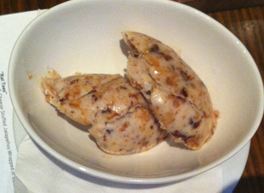 It was not quite as “wet” as other bread puddings I’ve had, so the texture was a bit off, IMO. Regretfully, I neglected to capture a picture of the bread pudding. And, Ann ordered a maple & something (I stopped reading when I saw “maple”) flavored milkshake served with chocolate-filled macaroons. It does LOOK good, but I wouldn’t get anywhere near the actual shake! When all was said and done, we were in complete agreement that our dinner at Local Three Kitchen and Bar was outstanding! The food was a hit with everyone, the wine was fantastic, and Patrick and the rest of the staff provided excellent and friendly service! 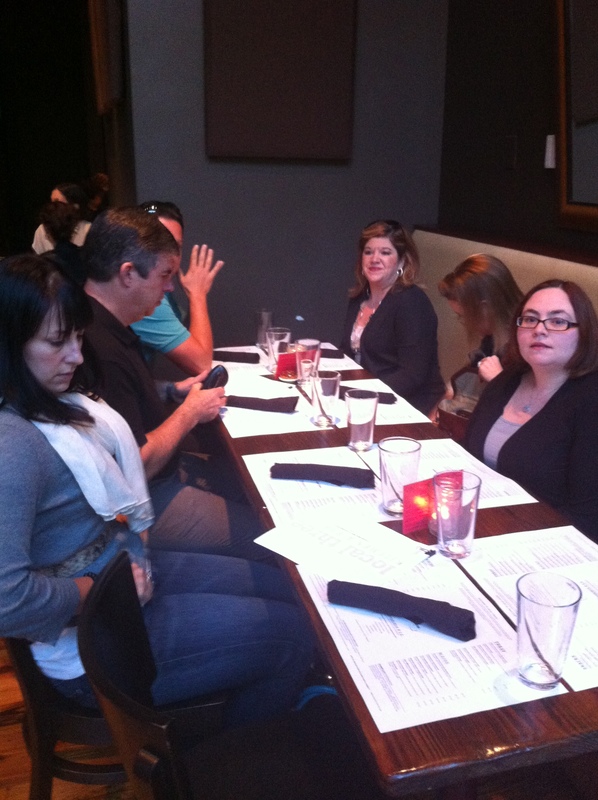 Thanks to the staff of Local Three for a terrific dining experience, and thanks to Christina for organizing the evening. If you’re in the ATL, please give Local Three a shot. And, when you do, please let me know how your meal was! Oh that’s winnin’ right there! Bacon grease spread???? Lovin’ that! 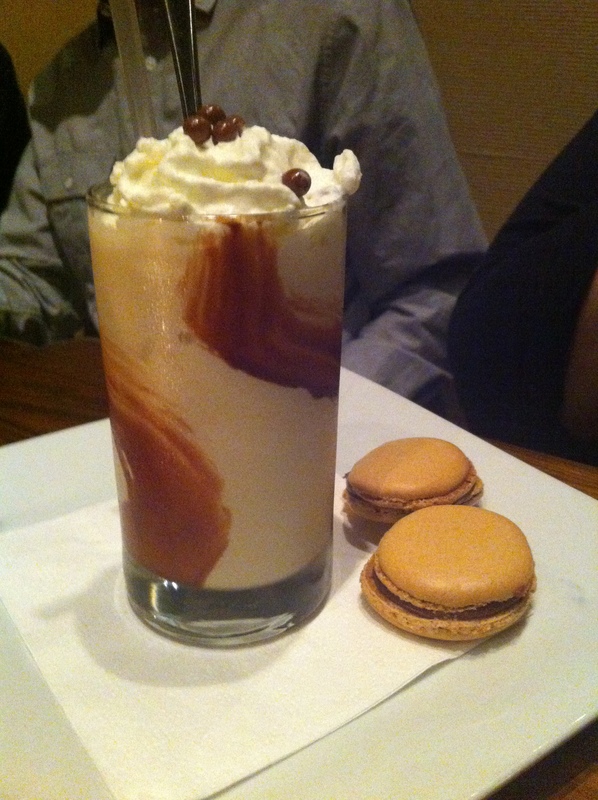 I know how you feel about maple, but that shake looked damn good too. Good to see ya had a chance to share this with us, lady. 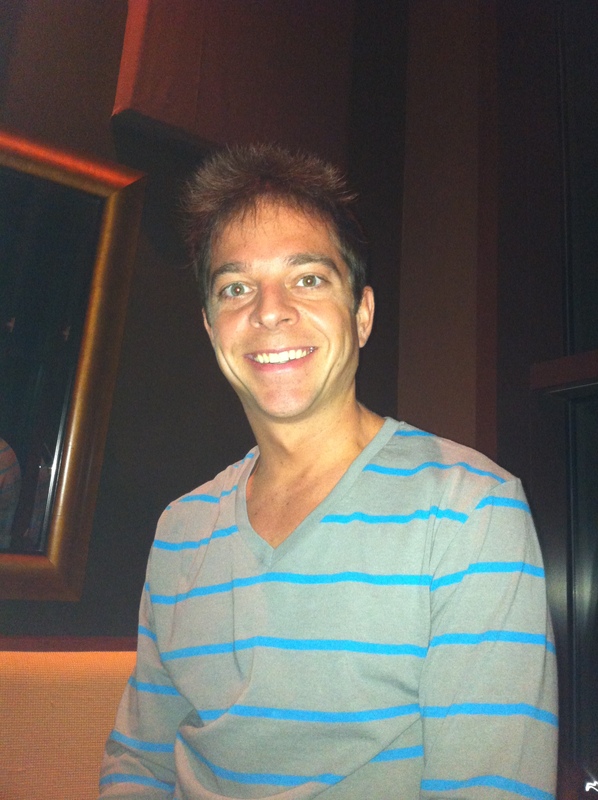 Ant, you would have been in heaven at Local Three! The food was tremendous! I can’t wait to go back. Thanks for stopping by the blog, Debbie! I was pretty obnoxious w/ the camera phone last week, but I think (hope!) I was successful in capturing the delightful dishes! Please let me know when you make your way to Local Three. I’m interested in your perspective!